Agreeing to stage a solo exhibition always seems like a good idea at the time. It is flattering to be asked. The request often comes many months, if not a year or more in advance and so all the work involved seems so far away as to be inconsequential. However, as we all know too well, time flies, and before we have taken breath, the launch date is fast approaching. There are a million things to be done, and our decision to do the exhibition seems increasingly foolhardy with each passing day. There is also the nagging, creative self-doubt. The cloud that haunts most of us, the voice in our head that whispers endlessly that our work is just not good enough. The closer the exhibition gets, the louder that whisper becomes until it is a screaming voice pleading with us to run away and hide. At least, I assume other photographers feel like me? Maybe I am the only one who looks at my work and sees it morph from images which originally delight into ones which seem dull and lacking originality. Familiarity kills confidence. It has always been this way for me. I have been through this before with each exhibition I have held, and I am guessing if it were going to change, it would have by now. I always admire artists and photographers who are prepared to show their work in an exhibition. It is one thing to put an image up on social media; it is quite another to hold an exhibition. Social media is a casual forum for displaying our work. Any feedback seems to tend towards the generic and bland. Our work sits in amongst thousands, if not millions of other images. Usually, it is soon forgotten, often in a click-beat. If we hold an exhibition, we are asking people to take the trouble to come and visit a location to see OUR work. We are printing and framing it, hanging it on the walls and saying, in effect, that we feel our work is worth your investment of time and money to come and view it, to perhaps even buy it. We must feel, whatever creative angst is waging war inside us, that the work has some merit and is worth looking at. I admire anyone who takes this step, whatever I might personally feel about their work, I know it takes bravery and commitment, as well as a not inconsiderable financial investment, to exhibit. So I admire anyone who takes this step, whatever I might personally feel about their work, I know it takes bravery and commitment, as well as a not inconsiderable financial investment, to exhibit. All who do so are opening themselves up to criticism. Everyone who comes to see the work will make a judgement of some sort. The more innovative the work, perhaps the less likely that the majority of visitors will like what they see. Thinking in terms of landscape photography, it is easier to hold an exhibition of crowd-pleasing, generic, chocolate box views than to exhibit more personal, less cliched work. I say ‘easier’ from the point of view of listening in covertly to visitors comments as they browse. Such images tend to wash over most people, are accessible and don’t offend or turn people off. However, for the photographer who presents work which is not as mainstream, listening in to those gallery conversations might be a bit harder to take. If the work is not as accessible or has narrower appeal, they have to accept that approval will be narrow too. However, those that do love the work will likely really love it, will be more likely to invest in it and perhaps, become collectors of the photographers work on into the future. Over the years I have been privileged to be part of group exhibitions around the country, usually hanging some of my images alongside the work of photographers far more talented than me. I have also had the opportunity to hold some solo exhibitions. Here, the pressure increases exponentially. Everything rests on you. On those past occasions I have, I must admit, taken the safer path and exhibited work which I knew would be more commercial, work which was more accessible to my potential audience. For my current exhibition, I decided to break with this pattern and display a collection of really personal work, no matter what the audience reaction might be. Last year I was honoured to be invited by the great team of landscape photographers who run The Peak District Photography Gallery, which is housed in the beautiful Old Market Hall Peak District National Park Visitors Information Centre in Bakewell on Bridge Street, to hold a solo exhibition of my work. The gallery is run by and holds a permanent exhibition of the work of five professional landscape photographers - Ian Daisley, Graham Dunn, Karen Frenkel, Chris Gilbert and Alex Hyde, so there is always some beautiful work on display. The group has had the foresight to put about a third of the gallery floor space over to a rotating exhibition of exhibiting photographers. This has many benefits. For the visiting photographers, it is a beautiful space to exhibit their work with great footfall in a busy tourist town. For the gallery, it brings fresh visitors who will view, not just the exhibition, but also the photographers in residences work. Everyone benefits. The staff of the visitors centre take payments on sales and for this service they take a commission on all sales. When they contacted me, I had been working for just over a year on a project which had become very important to me, based around a scruffy little woodland a few minutes walk from my home where I take my Cocker Spaniel, Stan, for his walks. Here was an opportunity to put on display some of the work from this collection. I knew it was a commercially brave decision. The images were not going to appeal to the majority of visitors, especially in a gallery based in visitors centre where many would be tourists looking for pretty pictures of the Peak District as a reminder of their holiday. In fact, I expected most visitors to be a bit baffled by the images as, in common with a lot of my work, they are soft, blurry and quite abstract in nature. The woodland, although unremarkable and seldom visited by others, except the odd dog walker, had become very important to me. I had become so familiar with it over the last eight years of having Stan. The fact it was so untidy, unloved and left to its own devices enhanced its appeal. It had become ‘my wood’. I decided to record it with my camera and set about doing ‘my thing’ in the usual way, diligently setting up the tripod in nice light and hunting for compositions. However, as I reviewed the results, I felt flat and disappointed with the results. No matter how hard I worked, no matter how good the light or conditions the results didn’t move me. They seemed to me to be simply record shots. They could have been of any woodland. I knew I wasn’t getting it right. Then about two years ago I had one of those photographic epiphanies that change us. I was on a ‘proper’ holiday, with Liz and Stan, in Snowdonia. I had been working intensively for many months before going and despite being in the midst of such beauty, I felt I needed a break from the camera. I had no desire to pick it up at all. Indeed for about 10 or 12 days I didn’t make a single image. We just sat and rested outside the camper van, we took long walks, I read books and just relaxed. Then on one morning we planned to take the steam train from Porthmadog to Caernarfon and back. I decided to take my camera. All the way there I didn’t use it but on the return trip, I suddenly got the old urge back. I was facing backwards in the carriage. We were in third class, as we had Stan, so the carriages were open sided. It was a clear blue sky day and as the train descended through the Aberglasyn Pass woodlands the steam from the train was being held under the tree canopy, sunlight sparkling through the leaves - it was magical. I set my camera to manual focus and prefocused about three meters outside the carriage. I set the camera to square format, mono and had a 35mm prime lens fitted. I then held the camera just out of the train window in one hand at arms length, and as things entered my peripheral vision catching my eye, I fired the shutter. It was very random. I was making no attempt to compose. I was simply allowing my brain to be stimulated by something almost unconsciously into making an image. Every few minutes I would quickly review what I was getting, and it became apparent that, although many shots were awful, that in amongst them were images which I found exciting and inspiring. I just kept shooting all the way back down. On reviewing the images back on my laptop at the camper van, I set myself some rules. Because I had made the images almost unconsciously, I didn’t allow myself to crop them. I simply converted the raw files to monochrome with a slight warm tone and vignette using the entire square frame captured by the camera. From the 400 or so images I made, I ended up with a complete project of about 100 images recording the journey. I entitled this collection ’Taeth Tren’ which means, I am told, “Train Journey” in Welsh. Each image is entitled with the exact time to the second that it was taken, and the set is viewed chronologically. So when I returned to my woodland at home I realised I could apply the same technique here (without the steam train, obviously). I set off as soon as I got back, the camera set up the same, firing the shutter in the same, seemingly random way. Each walk would yield 300 to 700 images. Each time there would be lots to delete, but in amongst them would be images which now captured ‘my woods’, not as they looked to me, but as they felt to me, and this is what was most important. I went on later to begin adding some images made using multiple exposures, some are shot on film, some have a little more thought put into the composition, but the vast majority are made using this technique. The entire project is called ‘Whipmans Wood’, named after the woodland. My exhibition is entitled ‘A Walk in the Woods’ and consists of 20 of my current favourite images from the project. All are monochrome, all are uncropped and use an identical tone. The majority have a slight vignette, but not all. I have found that many of the images in the project do not work well as stand-alone photographs. Seen in isolation they are weak. However, when brought together with others in the collection, their purpose becomes clear and viewed in this way they gain strength. However, images like these I would be reluctant to show in an exhibition. They may work well when seen on a wall with other images but if purchased and then hung alone I feel they may lose much of their power or effect. It is images like this that are ideal in books or portfolios or pdfs and so on. They add weight and interest to a project despite not being stars in their own right. If you are thinking of exhibiting your work, think long and hard. It is expensive - the printing, the framing, the administration, travelling, etc. You are very unlikely to sell anything, or enough to even get close to recouping your true costs for staging the exhibition. 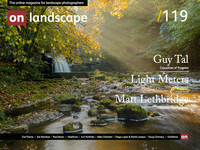 In the UK landscape photography does not sell well. People tend to place a low value on it. They feel they can take similar images themselves, or they think they can go to Next or Ikea and get some wall art for £30 so why pay gallery prices. It is warped thinking, but it is the way it is here. I hear that in the USA it is quite different, and a greater value is put on good landscape photography as art. So, if you can afford to cover the costs and can do it to raise your profile, for vanity and for the satisfaction of seeing your work on the wall (because it is a nice feeling, a sense of achievement, when the work is hanging, just before the doors open and you run and hide) then why not do it? I would always recommend working with galleries who DO NOT charge a fee for the wall space. I much prefer galleries who let you stage the exhibition for free and then take a commission on all sales. The commission is likely to be between 40 and 60% and this is fair (yes, it is - consider all of their overheads and the risk they take, giving you their wall space with no guarantee whatsoever that your work will sell - this is why they will vet your work much more heavily before allowing you to exhibit. They have to be confident your exhibition will be a success financially). I prefer this because the fee charging galleries have no real incentive to publicise your exhibition or to sell your work. Their money is made and their job done the day you sign up and rent the space. That is their business model. They sell wall space, not art. For them, it is a zero risk model (you are investing in yourself by renting the space and taking the financial risk) and as such very understandable that they use it. Galleries that work on commission have a very strong incentive to sell your prints. If they don’t, they go bust; it's as simple as that. In either case, you have all the upfront costs of getting the work printed and framed, etc. Once you have a batch of work framed it then makes sense to try and get it exhibited in several locations. The main costs have been born; now you need to maximise the exposure of your work and thus opportunities to sell it to recoup your costs and raise your profile to enable you to do more work. If you happen to be in the Bakewell area between now and the 30th August 2016, it would be lovely if you would pop in and see my exhibition. Don’t make a special trip - I’d hate it if you made all that effort and then didn’t like it - you do remember my creative angst, don’t you? Of course, there is also all the work of the other photographers to see and buy too, so it is well worth a visit. I would encourage you to go anytime you are in Bakewell as there is always new work on display.